Hi all, the past couple days have been crazy, to say the least, and I am suffering from a serious case of jet lag. That being said, I love going to New York and I love my job, so some dark circles under my eyes every now and then are totally worth it. 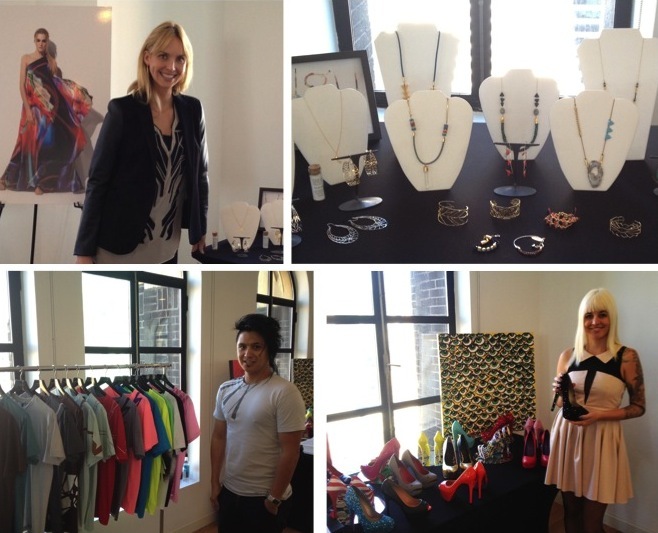 Below are a few pics from the spring fashion preview event I was in New York for. Clockwise from top left: Myself in the event space on the 25th floor at the Bryant Park Hotel, standing by a poster of a spring look from Wallis; A stunning display of Kris Nations jewelry; Designer Taylor Reeve with her debut collection of heels for TaylorSays; Jeremy Fortes of the new fashion t-shirt line Beastmode. Yes, new york is amazing and it sounds like you have a pretty amazing job too !